Create links to sibling pages. A page-based previous/next link provides a way to automatically link to sibling pages. The link updates automatically when you make changes to the page tree. It is commonly used for pagination controls. A sibling page is defined as a page that is at the same level in the page tree as the current page. Pages configured to be hidden are excluded from the navigation, and the order in which sibling pages are linked is given by their order in the page tree. You configure the component by specifying the text and whether the link goes to forward to the next sibling, or backward to the previous sibling. Text A page-based link can update its text automatically based on the page tree. 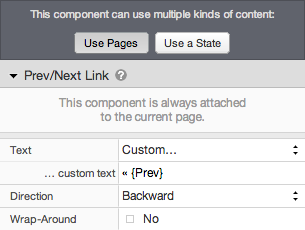 You can choose to display the name of the current page or the name of the link’s destination page (the “next” page). Enter custom text by choosing “Custom…” A new Custom Text setting will appear below the Text setting. You can also choose not to display any text. This can be useful for creating an image map. Custom Text * Custom text for the link. Direction Whether the link goes backward to the previous sibling or forward to the next sibling, as shown in the page tree. Wrap-Around This setting only applies when there is no next (or previous) sibling page. When to Yes, the link “wraps around” to the beginning (or end). When set to No, the link is simply disabled.